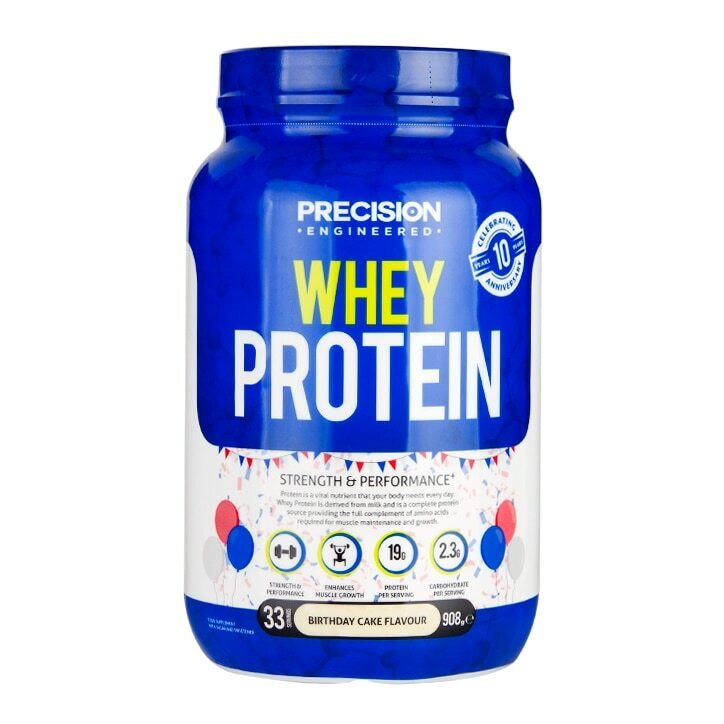 With three forms of premium grade protein (isolate, hydrolysed and concentrate), as well as a comprehensive amino acid profile, Precision Engineered Whey Protein Birthday Cake tastes great, and is the perfect choice for your training and fitness goals. Protein Blend (Whey (Milk) Protein Concentrate (WPC80), Hydrolysed Whey (Milk) Protein, Whey (Milk) Protein Isolate), Biscuit Flavouring, Vanilla Flavouring, Emulsifiers (Soya Lecithin, Acacia Gum), Sweetener (Steviol Glycosides), Maltodextrin, Coconut Oil, Sucrose, Antioxidants (Sodium Ascobate, dl-Alpha Tocopherol), Beta Carotene, Anti-Caking Agent (Silicon Dioxide). Precision Engineered Whey Protein Birthday Cake is rated 2.7 out of 5 by 10. Rated 1 out of 5 by Hugh21065 from Terrible product I can’t believe how watery the flavour is,not sweet enough and generally worth avoiding. Rated 1 out of 5 by VickiG from Tasteless Bought this after being a fan of several of the flavours but can honestly say there is no taste to this at all, even with Almond Milk.... Dont recommend at all!